This tour of some of the historic sites of North Antrim was organised by the Belfast Naturalists Field Club. The first visit of the day was to Bonamargy Friary (D126408).This was founded by Rory MacQuillan about 1500 for the Third Order of Saint Francis. The buildings are approached through a two-storey gatehouse set in an earth bank. The long narrow church has a doorway and three windows in the S wall and an E window with broken tracery ans decorated label stops. The cloister lay to the N of the church and in the east range was the sacristy and the day room. Theses have fine barrel vaults. Above this was the friars' dormitory. The 17th century vault running S from the church is the burial place of the MacDonnells, Earls of Antrim. At the W end of the church is a small holed cross. It is said to mark the grave of the Black Nun, Julia MacQuillan, a prophetess and recluse, who lived here in the 17th century. About 2km E of the friary is Culfeightrim Parish Church. In the graveyard is a pair of standing stones (D144408). The taller stone is about 2.7m high and 70cm square. The smaller stone is lozenge shaped and is about 1.7m high by 70cm wide and 60cm thick. A third stone was moved from its original position and now serves as a grave marker in the centre of the graveyard. Two cist burials were found at the original site of the third stone. Lunch was taken beside Armoy Round Tower (D078332). It has a very narrow doorway about 1.5m above present ground level. It is known to have been at least 2.5m above ground level at one time. It is reckoned to be the narrowest Round Tower doorway in Ireland and is about 50cm wide at the bottom. It is capped by a single stone with a raised moulding. The tower now stands about 13m high. St Patrick baptised St Olcan here and later placed him as bishop over the church. The churchyard has some interesting 18th century gravestones. After lunch we visited Stranocum Rath (D013296). It is situated on a ridge overlooking the River Bush. It has a high platform and inner bank, a wide ditch and a great outer bank. The rath is about 50m diameter and although the bank has some large gaps it is most impressive. The ditch is about 4m wide and the height from the bottom to the top of the bank may be 5m in places. The original entrance may have been inthe gap in the south. The rath contains a souterrain near one edge. It is possibly 10m long and L-shaped. However only the entrance lintel is now visible and the souterrain is not accessible. Our visit to Knockahollet Motte (D049231) did not go ahead as planned. The approaches to the motte are extremely muddy and only Richard Clarke had the courage to ascend the hill and climb the motte. It stands within a circular enclosure about 70m diameter. The motte occupies the eastern part of the enclosure and there is a crescentic bailey in the west. The motte is 4.6m high and 8.5m diameter at the top.It is surrounded by a ditch about 1m deep. The bailey is about 3m high. Dooey's Cairn, in Ballymacaldrick (D021182), was much more accessible. It measures about 21m by 14m. It would have been wedge-shaped, or trapezoidal, with the widest point at the SW end. The main feature is the well preserved deep court at the SW end. This is constructed of large orthostats with the spaces between filled with drystone walling - the post-and-panel technique. Running NE from the court is a single burial chamber built with orthostats in typical fashion. Running off the back of this is a long chamber built of dryatone walling with pits in the floor. This is thought to be a cremation passage but it is not known if it is an original feature. On the other side of the hill, in Craigs, there are several megalithic structures. The Broad Stone (C979176) appears, at first glance, to be a tripod dolmen. Closer inspection shows that it is a three-chambered court tomb. The large capstone is about 2m square and 30cm thick.The back supporting stone is not in its original position since it blocks the gap between the first and second chambers. There is a shallow forecourt and the tomb is set in a long stone-revetted cairn. 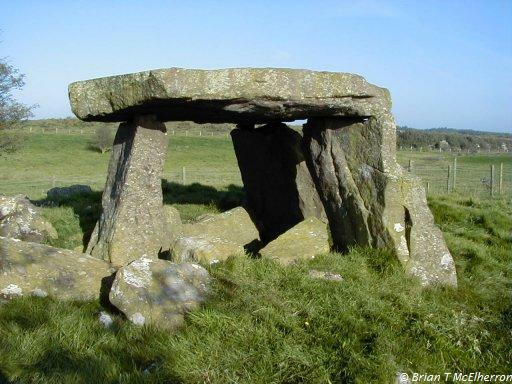 Craigs Dolmen (C973172) is a small tomb consisting of seven orthostats supporting a capstone. The structure is classified as a passage tomb even though there is no passage evident. The burial chamber would have been covered by a small round cairn kept in place by a kerb. It is similar to other small passage tombs in Co Antrim.